*Note: Warning! Carefully be away from of this man! 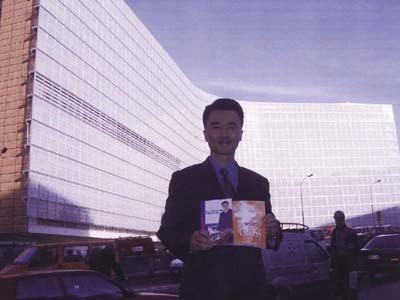 Jonny Kim, the director of overseas mission, who is the right arm of Lee-Jaerock, poses in front of the EU Headquaters in Brussel, Belgium. August 2004. He has special talent to turn the Christ's ministers into the followers of the dangerous cult leader by his smooth words about the healing power. Where does the power come from? He prefers to take picture with idolized Lee-Jaerock's picture. (see left one) Lee Jae Rock'n'roll (Lee-Jaerock), Korean Raël, had succeeded in mystifying French evangelic pastors! Contrary to the movement of Yonggi Cho (David Cho, Chairman of Assembly of God, Korea), which had caused mistrust, before gaining years after the confidence of the Korean evangelic community, the ministry of Lee-Jaerock knew a fulgurating rise. Cures, miracles, immediately were worth to him a statute of authentic Minister for the Gospel and the one among the servants of God. However, since 1990, it was excluded from the movement to which it belonged (Movement of Holiness). 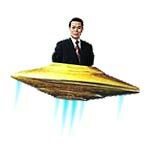 In 1999, the Council of the Churches of Korea (cck.or.kr, Han Ki Chong) excommunicated it. Since, as well as the site of precise reference of the Korean Christians Godpeople.com, the movement of Manmin is regarded as a sect. 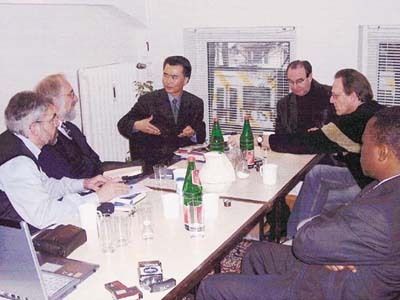 * Note Jonny Kim, the Korean sect ambassador is spreading cult teachings to French and German church pastors to enable allied gathering, which had held in Obershausen, German by Manmin sect. Same causes, same effects in France? It was not surprise to find these cult teachings, on the site even of this sect, well in the "VOD (Video On Demand)" and among most recent, a "Pilgrim voyage into Holy Land" [see video, they recently deleted the UFO and mysticism related screens! ] expecting under this title to find an inoffensive account of voyage in Israel. But several Net surfers noted with fright that the "Holy Land" in question was in fact Egypt, country in which Lee-Jaerock carried out a pilgrimage regularly (each year, the most active members of the church in the evangelization also see themselves offering the voyage). In this video, we learn that the pyramids are spiritual buildings, that Adam would have gone several times to Egypt to teach building arts for worship buildings, which is the science technologies which would have been lost since the Garden of Eden. The pyramids would actually not have created to be useful of tombs, but like large catalysts of the energy and "capacity of Creation" (see below). Like Napoleon, these high spiritual places seem to fascinate Lee-Jaerock. But it is not all. 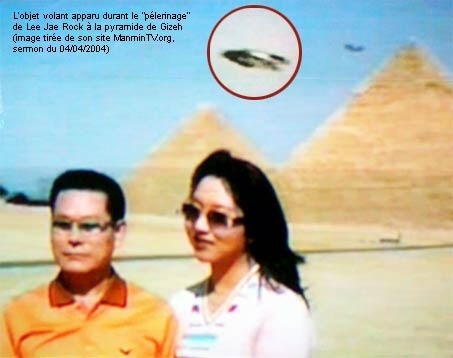 Towards the 25th minute appears, on a photograph where Mr. and Mrs. Jae Rock pose in front of the pyramid of Gizah, an UFO, an oblong and metal form (see screen printing below). According to the "leader" of the sect, these UFOs are spiritual objects, and it is necessary to have spiritual knowledge (the 4th level thus, to see below) to include/understand their divine origin. For Lee Jae Rock'n'roll, there are 4 levels of power, and an ultimate level, which is the power which took part in creation. One arrives very quickly there in the thought typically New Age of the guru. But let us look at the first 4 levels of power. The first would works by the power of the Holy Spirit, to burn germs, diseases, microbes and cancers. The second, would drive out the demons or would point out the heavenly residence of the people died for the resurrection. The third level would make it possible to achieve works of restoration of broken members, and cure on patients of born-blind men, etc. And the fourth would thus operate in works of pure creation: not only regenerate cut-down members of body. but also miracles like physical signs in nature, supernatural control of the elements, etc. The man who arrives to this degree of power has the capacity on creation and on the creatures, it arrived at the ultimate stage of power which a man can receive, and according to Lee-Jaerock, well few men arrived there. He possessed this power. of this sect. This phenomenon is told to be frequent. The intelligent design, preached by the scientists combined to this sect, resembles a modernized and extremely tempting form of the creationism. With a little imagination about Christian Science, another sect well-known, the "expert" (or the follower arrived at the ultimate stage) can release energies. The cure in the name of Jesus becomes completely additional here, since once again it is the sanctification of the subject which releases energy, and not the sovereign will of God. Actually, the prayer of authority is made not in the name of Jesus Christ but "by the fire of the Holy Spirit and the power of Creation".. Besides these New Age doctrines of "the power of creation", there was the subject of a thesis very recently in the USA, which caused an impassioned controversy again, as an article from Press Reunion testifies to it. In addition to the completely New-Age doctrines of the "leader" of Manmin, it consequently appears abusive of saying, as certain French pastors still do it, that they are divine miracles. "For the gifts and the calling of God are irrevocable. "(Romans 11:29). It seems obvious that there must be another power (not of Jesus), that Lee-Jaerock visited to collect in Egypt near the pyramids. The members of the Manmin sect have sought for more than 20 years for the construction of what they call the "Great Sanctuary (*note: or Grand Sanctuary, Great Temple)" (see below). In the theology of Lee Jae Rock'n'roll, the Great Sanctuary occupies place in the capital, Seoul: it is the equivalent to the Temple where Solomon and his people were to adore according to the old will of God. This gigantic building, which can accomodate 200,000 people, would be in the plan of God since very the creation of the man, as one can read it in the writings translated into bad French on the website of the sect. It is said to be constructed which all the members must work, by a sacrifice and an offering of "faith and love". According to Lee Jae Rock'n'roll, the situation in the Middle East will let him find its money source politically and financially when the leaders of the world come to back up the construction of "Large Sanctuary" (source - 59th minute). This kind of assertion is also very clearly discerned when one examines it in the light of biblical prophecy, but also completely frightening when one intends the Manmin "leader" to tell that his missions in the world have another goal that was just made converted, which will come in their turn to finance the construction of the Sanctuary. Before briefly enumerating other doctrines, as brought back on the anonymous website of warning (http://www.angelfire.com/space/lee_jae-rock/) against the sect of Manmin, let us say simply that the man appears completely mythomania: all things turns around him and any event is interpreted for his favour, like a sign or a divine intervention, even in the most debatable cases (the examples is abundant, let us mention simply those quoted on the video about which we already spoke: its "miraculous" entry in Israel, whereas he was only one simple tourist; video says winds were retained by angels in Egypt; "miraculous" time at the time of his voyage on the sea of Gallilee, etc). Here is thus hereafter some of its most outstanding assertions: 1) The prophets, the disciples of Jesus, the apostles, God and Jesus himself would have appeared on a photograph on which it would have imposed his hands (declaration of the 17/07/1998). 2) Whatever the place of planet where they are, people can see the portrait of Lee-Jaerock because it appears in the sun and the moon. It can even appear on the envelopes of offering (declaration of the 26/06/1998). 3) 4 archangels would have come in his church on July 3, 1998, then God would have come there in person and then 20 additional archangels. 4) He said the sin would be contained in the blood of the men, and he himself is told to have been entirely transfused in 1992, with the blood without the nature of sin. 5) When Lee-Jaerock calls one of the prophets, of disciples etc they appear immediately in front of him. 6) The spirit of Jae-Rock'n'roll is with the left of God. 7) He also has the power on the life and death. 8) It became one with God, this is why it can appear in the moon or the sun. To learn the lessons from this error?